There are SO many moves going on right now. I mean, like A LOT of moves. As you know, the mambi corporate offices moved at the end of October (and we're still getting settled), Kevin and I have moved from our home a week later. We stayed in a vacation rental for 6 weeks and are now in a Residence Inn for about a week. We hope to move to our new home in beautiful San Clemente, California at the end of this week..that's right...two days before Christmas. 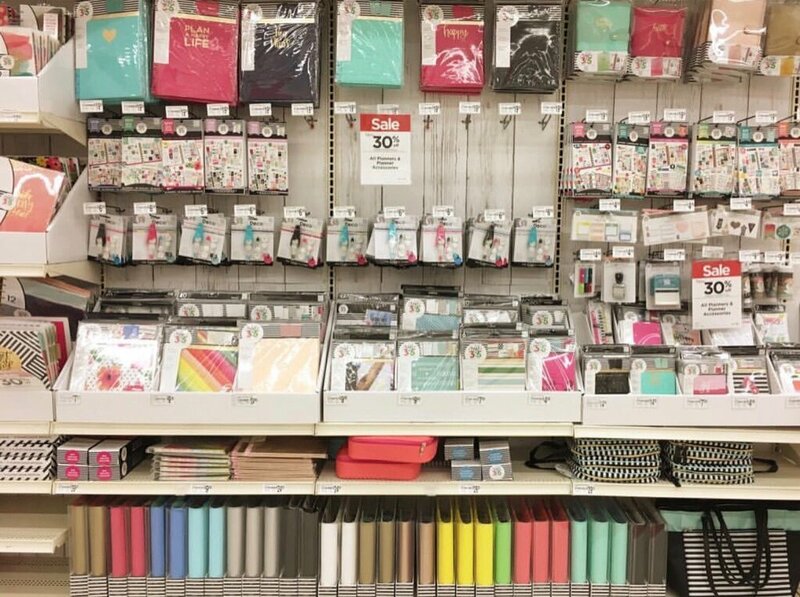 AND The Happy Planner has moved to a new home in Michaels! This beautiful inline space is a more permanent home and is so great to shop! I mean look at all those sticker value packs! I can't even take it. I love seeing all the photos of your Michaels Happy Planner hauls. I see so much planning and goal-setting in your futures. If you follow me on Snapchat (thehappyplanner), you might have seen the fun we had at the me & my BIG ideas holiday party. There was dancing and singing (thanks Charon, Hannah & Kayla) and lots of good food...and drinks. I am so thankful for our amazing team here at mambi. They make all of our BIG ideas come to life and we couldn't do it without them. As we get closer to the holidays, on behalf of my entire family (and the mambi team), we wish you all the happiest holiday season. Get ready for a HAPPY and PRODUCTIVE 2017! Hi Happy Planners! I'm back and I'm blogging! I'm so excited to start this weekly blog post. Every Monday, I'll be sharing the exciting things happening here at me & my BIG ideas® and The Happy Planner™. For years, I kept a personal blog and I loved it. There's just something about blogging that works for me. However, the increasing demands of our business forced my early retirement from "the blogisphere". But one day a week? I can do that. We started me & my BIG ideas in my garage 18 years ago. What? How can that be?! But the last year and a half, since we released The Happy Planner, has been the most extreme rollercoaster ride ever. More rewarding than I could have ever imagined. And we have YOU to thank for that. From the bottom of my heart, I thank you on behalf of our entire family (actual family & mambi family). For a steady stream of inspiration, you can follow us on all of our social media accounts (links at the bottom of this page). If you're looking for more of a behind the scenes and personal view of mambi and The Happy Planner...follow the fun on my personal accounts. So...let's get this blog party started! We started a YouTube channel for The Happy Planner™! You can click the image below to check it out and subscribe! We have so many BIG ideas for this channel...product previews, plan with me, planner basics, vlogs and more! The mambiSHOP will be closing Wednesday, 12/21 at 6 PM Pacific - 1/2. This will enable us to take a physical inventory, move the fulfillment center and to allow our hard-working employees to spend the holidays with their loved ones. AND...when it reopens, it will be re-branded as The Happy Planner™ SHOP and will focus on planner product. The function will be the same but will hopefully be a little easier to navigate. Please feel free to use the comment section for general questions, comments and conversation. If you have a customer service question, please email Chantelle at customerservice@meandmybigideas.com and she will be happy to help you.